We are a very small steel tongue drum family run business. We have two drums we call our own. The popular TurtlePan and the large bodied original TuneTank. Each drum is hand crafted with careful attention to every detail. We have been making drums in Ontario Canada since the summer of 2008! Yes we are young, but we are good! We offer you the personal touch and will work closely with you on your drum order. 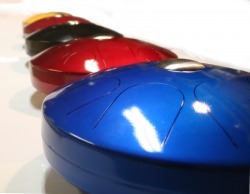 We speak with honesty and integrity at Percussive Devices. We take pride in our quality, and strive to make every drum an instrument you will be proud to own and play. Our drums sound great, look great and come with a money back guarantee. See our guarantee details here. My interest in making musical instruments led me to a video by a man named Dennis Havlena. I was so impressed by this gentleman's talents and ingenuity, I started to watch more of his videos and came to this one, a video of the first Hank Drum. I just had to try to make one myself. I bought a 11lb propane tank, which is half the size of Dennis's full size 20lb tank. It sounded great and was so much fun. I decided to make a full size as well. It was just as much fun. I enjoyed the process so much that I made a 1/2 dozen or so. I sold most on eBay and got great comments all around. I also made a gift of one of these Hank Drums, which now is enjoyed by the students at a local high school. I soon wanted to create my own steel tongue drum from the ground up. So after many hours of research, trial and error, tweaking and a few dead drums, I have developed the TurtlePan. So far I have received nothing but great reviews from many excited customers. The TurtlePan is being enjoyed all around the world. Canada, the US, England, France, Italy, Australia, Russia, Japan and more. We will continue to look for ways to make the TurtlePan even better and hope to be making these drums for as long as there are people wanting to play them.